As a vote nears, the bear hunting issue comes down to doughnuts. I’ve spent much of the last two weeks caught in the middle of a bear fight. Not between real bears, although I have a hunch that might be easier to navigate. No, this one’s between humans. It pits those in favor of this November’s statewide referendum to ban the use of traps, hounds and bait to hunt Maine’s black bears, against those who consider those techniques critical to controlling a bear population now estimated at 32,000 and slowly climbing. 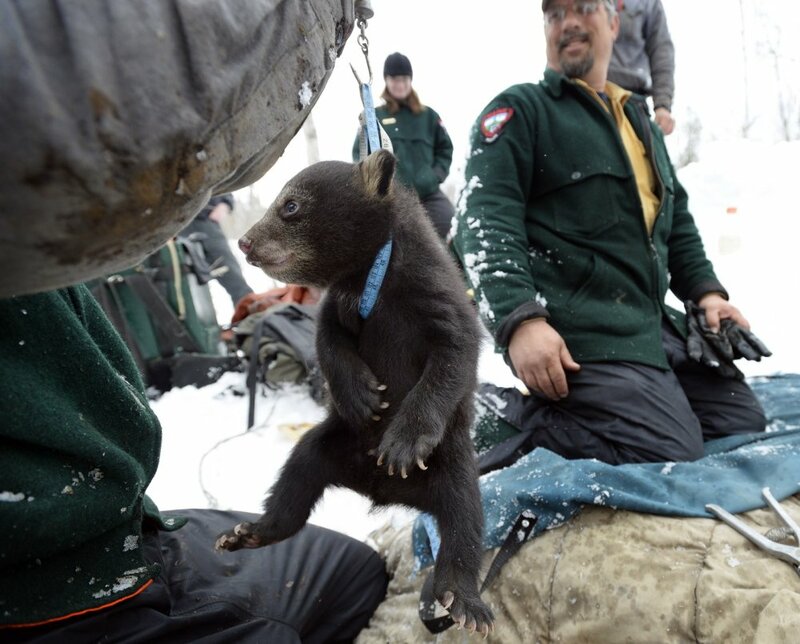 A bear cub is weighed by technicians with the Department of Inland Fisheries and Wildlife. Mostly, though, this fight is about doughnuts. A bear den visit? Sign me up, I told Cote. Fast-forward to March 12. 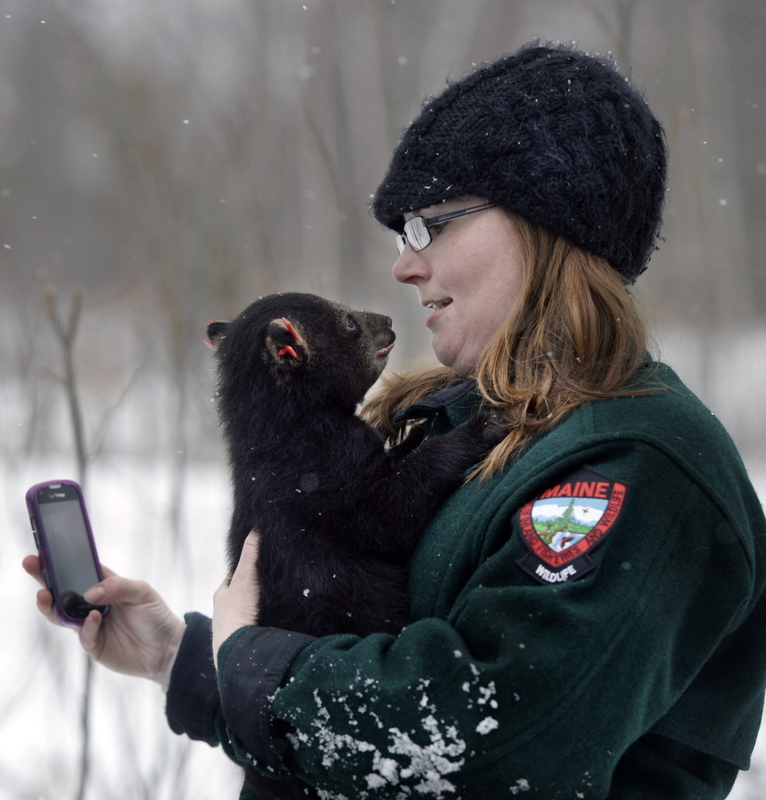 There I stood at the edge of a bear den some 25 miles west of Ashland in Aroostook County, holding a 2-month-old bear cub in one hand while state bear biologist Randy Cross and his team of researchers went about gathering data on the cub’s sedated mother and installing a new battery for the radio collar around her neck. Considering that this repeat of a 2004 bear-hunt referendum (when the ban was defeated, 53-47 percent) is all about the end of a Maine bear’s life, it occurred to me during my trip north that watching a full-grown Yogi Bear get shot might be more relevant than watching Boo-Boo get tagged on both ears as the latest recruit in Maine’s 39-year-old black bear study. But hey, how often do you get to hold a baby bear in your hands without having your scalp shredded by its angry mother? I also chatted at length with Cecil Gray, a master Maine Guide from Skowhegan. He supports the work of the researchers but is troubled by what he sees as a cozy relationship between the Maine Department of Inland Fisheries and Wildlife and a sprawling community of outfitters who make a living helping hunters – at $2,000 or more per client per week – “harvest” a bear with a minimal amount of effort. I’ll spare you the back-and-forth volleys, which went on for days both by phone and in my now-cluttered email inbox. Instead, let’s just cut to the chase on what’s driving this debate. In 2012, the most recent year for which hard data are available, 3,207 bears were taken by hunters – 63 percent of whom came from out of state. Of the total bears killed, 60 were shot by hunters who happened upon a bear while deer hunting, 66 bears were caught in traps (a cable snare that tethers a bear to a tree until the trapper arrives), 100 were taken by “unreported methods,” 368 bears were run down by hounds (who wear radio collars so the hunter can keep track of them as they typically chase a bear up a tree) and 2,613 bears met their demise as they visited a bait site (which outfitters set up via leases with various landowners) during the four-week baiting season. In other words, with 81 percent of the bears taken by bait, hounding and trapping are statistical sideshows to the much-preferred method for attracting and dispatching a bear in Maine. In fact, there’s general agreement on both sides that if the current proposed ban was limited to trapping and hounding, this fall’s referendum would win hands-down. So for the most part, this is a battle over bear baiting. Which brings us back to those doughnuts. On July 26, exactly four weeks before Maine’s four-week baiting season begins, outfitters will begin setting out barrels brimming with stale doughnuts, pastries, breads, granola, oats, molasses and other treats that appeal to a bear’s sweet tooth. No one keeps track of exactly how much bait goes out into the woods each season – in fact, according to referendum proponents, most outfitters recently have scrubbed their websites of any and all references to bait volume. That’s at least 200,000 pounds of food spread out over 150 sites, or an average 1,333 pounds of bait per site. Next we go to the 2,613 bears taken by bait in 2012. Using the widely accepted ratio of two bait sites for every bear taken, it’s reasonable to assume Maine has around 5,200 bait sites scattered each fall mostly across the northern woods. Now let’s do the math: With 5,200 sites, each stocked with 1,333 pounds of bait over a hunting season, you get 6.9 million pounds of food being introduced annually by humans into the black bears’ food supply. That’s a lot of doughnuts. Opponents of the referendum argue that baiting is necessary to help keep the lid on a population that has grown by almost a quarter since 2004. Take away the hunt, they warn, and we’ll see fewer bears harvested and more chowing down on our backyard bird feeders. But what about the sweets? Wouldn’t elimination of the bait as a significant food source reduce if not halt the growth in the population? “If you take all the data as a whole, it’s pretty compelling that hunter bait is not a big issue,” said Cross, the bear biologist. Rather, he said, his research shows a direct, year-by-year correlation between cub mortality and yearling weight gain on the one hand, and the availability of berries, nuts and other natural food sources on the other. While bait might help an occasional bear survive during a lean year in the woods, Cross said, there’s scant evidence to suggest it’s a primary source of food for the overall population in any given year. Referendum proponents, meanwhile, insist that baiting essentially turns bear hunting into bear farming – the bait props up the population, which in turn props up a multimillion-dollar industry dependent on a steady and accessible supply of bears. The debate has many and varied other threads. Proponents point out that state biologist Cross is himself a registered Maine Guide, suggesting a possible conflict of interest if he studies the species one month and hunts it the next. Cross counters that he uses his guide license primarily for river trips, hasn’t personally hunted bear in over a decade and has never guided a bear hunt for profit. Do you accept the researcher’s assertion that bear bait, mountainous as it may be, enables the annual harvest without artificially inflating Maine’s bear population? Or do you side with those who say it it’s downright disingenuous to put millions of pounds of food out in the woods and then claim it has no effect on the species? And finally, if you conclude that the bait is in fact making it easier both for bears to flourish and for hunters to go home with a bearskin, is there anything fundamentally wrong with that? Me? As Maine comes out of hibernation, I’ve never felt more in sync with our 32,000 sleepy black bears. I’m dying for a doughnut.